DENVER, CO. — Former Broncos tight end and current NFL analyst, Shannon Sharpe, has been named the keynote speaker at The Journey, the Junior League of Denver’s fundraiser to support literacy efforts in the Denver metro area. The event takes place on March 13, at the Hyatt Regency Denver Tech Center beginning with cocktails at 6 p.m, followed by Sharpe’s speech and dinner. Tickets for the event are $125 per person. 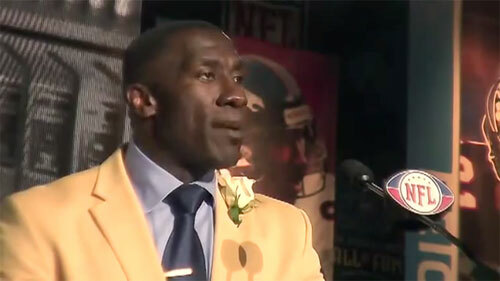 Photo shows Shannon Sharpe delivering his Hall of Fame speech in 2011. “Attendees are helping us get books and tools to families in need in the Denver metro area,” said Junior League President Lisa Lumley. “In addition to our literacy programs, we sponsor One Book 4 Colorado, in partnership with Lt. Gov. Joe Garcia and the Mile High United Way. It is not a well known fact, but Sharpe did not learn to read until he was in his early teens. Sharpe was guided by his grandmother’s influence and has since dedicated his life to literacy and education. All funds raised by the event allow the organization to provide financial and volunteer support to its community partners. Sharpe, a former tight end who played for the Denver Broncos and Baltimore Ravens, and is currently an NFL commentator for CBS Sports. He was elected to the Pro Football Hall of Fame, and inducted on August 6, 2011. He played 12 seasons for the Broncos (1990–99, 2002–03) and two years with the Ravens (2000–01), winning three Super Bowls. If you would like to book football speakers or athletes like Shannon Sharpe for a speaking engagement, autograph signing, product endorsement, Super Bowl party, charity fundraiser or special event, please contact Shannon Sharpe’s booking agent for appearance and speaker fees at Sports Speakers 360.